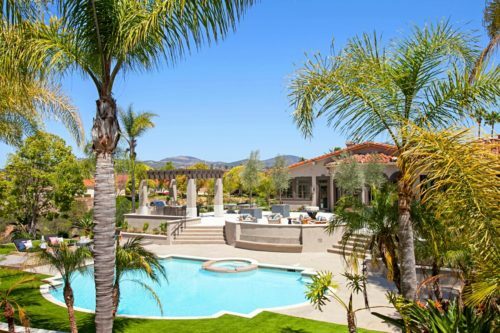 SAN DIEGO–Jackson Design and Remodeling (JDR) said today that HGTV editors have selected the company as one of 12 nominees to compete in the 2019 “Ultimate Outdoor Awards” competition in the “Outdoor Oasis” category, for the design-build remodel of a breathtaking outdoor living space in the San Diego community of Rancho Santa Fe. The outdoor retreat is titled Resort-Like Cabana and Pool. Voting begins online March 27. The public can view and vote in each of the four categories once a day, every day, until April 17. HGTV’s Ultimate Outdoor Awards celebrate landscape architects, architects and designers who are creating beautiful outdoor spaces. Participating designers compete in four categories: Gorgeous Gardens, Curb Appeal, Outdoor Oasis, and Waterside Paradise. Voters select their favorite project in each category. The projects with the most votes will be recognized with the People’s Choice award. Contestants can also win the HGTV Editors’ Pick award if their project receives the most votes from the HGTV editorial team. Senior Interior Designer Tatiana Machado-Rosas and Licensed Architect John Kavan together designed this stunning retreat to enhance outdoor living on a grand scale for a couple who loves to entertain and spend time together as a family. The home is located on over two acres with stunning views of rolling hills reminiscent of Tuscany. The original outdoor space was dated and disorganized and did not take advantage of its beautiful natural surroundings. The new design starts with the cabana addition, with bi-fold glass doors capturing the awesome natural beauty of the home’s surroundings. Inside the cabana, a custom-built pool table and arcade table, seating and entertaining areas, and several spaces for other games provide comfortable and luxurious relaxation. The outdoor area encompasses a pool and lounging area, a custom ping pong table, a jacuzzi, a full kitchen, and a terrace with a fire pit. The upper and lower terraces are now unified and oriented to appreciate natural beauty. Appealing symmetry and order dramatically enhance the visual relationship between the outdoors and the existing home and establish a welcoming environment that inspires relaxing and entertaining in any season. The judges will review the winners of the People’s Choice and the HGTV Editors’ Pick awards to select an overall winner based on the quality of the design work, innovation and creativity of the project, the relevance to the category, and the utilization of available square footage and materials. Voting for the competition begins today. The “Ultimate Outdoor Awards” competition will end April 17 at 2 p.m. PT. Click here to vote.